Two individual, lifetime collecting journeys unite to create an art collection that spans three centuries of New Zealand art history. Peter Jarvis & Helene Phillips in their Taupo home. Supporting artists and collecting and selling art have been the foci of Peter and Helene’s professional and personal lives; the result is an extensive and varied private collection. Now, Peter and Helene feel it is time to simplify and refine their collection, and are releasing 70 works that traverse the history of New Zealand’s fine art practice. Peter Jarvis’ art collection began in a Christchurch pub in 1967. His first purchase was a splendid watercolour by William Mathew Hodgkins, which he purchased for $1,400: not an insubstantial sum at the time. This watercolour, which is still a favourite painting, was the first acquisition in a collection that burgeoned into some 600 works and marked the beginning a lifelong passion for art as both a collector and an art dealer. Following the well-trodden path of many collectors, Peter developed a keen interest in contemporary art and his collection expanded, although his love for the artistic heritage of the 19th century never waned and still forms an important part of his personal collection today. Peter’s expanding collection and growing interest in New Zealand art history led to the establishment of Ferner Gallery, a business that specialised in the resale of high-quality, original New Zealand art from the 19th, 20th and 21st centuries. Named after the street in Mt Albert where Peter lived, Ferner Fine Arts, as it was first known, opened in Eden Terrace in 1986 and moved to Parnell in 1998. Peter’s late wife Adrienne Jarvis owned and operated her business Under Silkwood Bookshop next door to the gallery in this new location. Adrienne loved books and art in equal measure. Her scholarship and knowledge of New Zealand and international artists were invaluable to Peter and their business in these years; she shaped the exhibition programme, and was contributor to and editor of their fine art catalogues and artist monograms. Helene Phillips started collecting art, including ceramics and ‘objet d’art’, in the late 1970s and, since then, she has been actively engaged in a variety of roles across the creative industries. She was a member of the QEII Arts Council Northern Region in the early 1980s, and her involvement on boards and foundations continues to this day – well into her supposed ‘retirement’. In 1988, shortly after joining the team at Ferner Gallery, she met the Northland artist Kura Te Waru Rewiri and they formed a long and close association, both personal and professional. This relationship cemented Helene’s interest in the endeavours of women artists, whose work makes up the bulk of her collection. Kura Te Waru Rewiri’s work is represented in the sale by A Construction of a Past, a 2002 work which was loaned to a retrospective exhibition, Story of a Māori Woman Artist, at the Māngere Arts Centre in 2012. Alexis Hunter, also represented in this sale, was one of a number of radical women prepared to explore issues that were current in feminist sexual politics, and her work remains a testament to the ongoing challenges of women and women artists. Helene and Peter’s pathways crossed when Helene joined the Ferner Gallery staff in 1988. Throughout the next two decades, they worked together to expand Ferner Gallery into a nationwide business with galleries in Auckland, Wellington and Christchurch. In 2002, they opened a second gallery in Auckland, taking over the Lorne Street space formerly occupied by their friend and fellow art market pioneer, Warwick Brown. In 2008, Peter and Helene retired to Taupo, and, in the years since, have shared their collection with the public by making their home and garden available by appointment, and providing their expertise to mount fund-raising exhibitions at conferences and museums in Taupo and Rotorua. 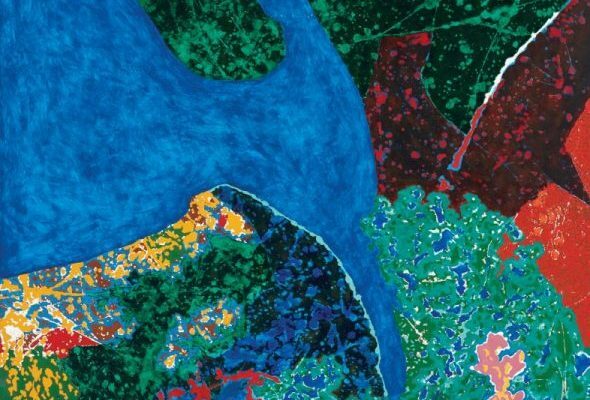 The first exhibition, at what became Ferner Gallery, was a collection of works by Rudi Gopas, one of the most influential artists of the modernist period. Gopas, an artist and teacher whose expressionistic and experimental painting approach antagonised academics at the time, was hugely influential on a later generation of artists, including Philip Clairmont, Tony Fomison, Allen Maddox and Philip Trusttum. The work by Gopas in this collection, Baltic Boats, was painted in 1963 and is of a quality that is comparable to that of his works in public collections throughout the country. Peter and Helene were champions of the early modernists and artists who were yet to be acknowledged broadly for their achievements. Retrospective exhibitions were held for Emily Jackson, Doris Lusk, Juliet Peter, Helen Stewart, Garth Tapper and E Mervyn Taylor, with published catalogues acknowledging their contributions to New Zealand art. From its inception, Ferner Gallery promoted the work of New Zealand’s women artists, attempting to address the representational imbalance between female and male artists.Exhibitions focused on a revolutionary generation of female artists working in the wake of the Depression and World War I, who had boldly ventured into the largely male-dominated modernist movement and singularly committed themselves to their art. Many such artists struggled to gain recognition with their work largely ignored during their lifetimes. One such instance was the gifted artist Mina Arndt, whose work had achieved great heights in pre-WWI Europe. Her painting career was cut short on her return to New Zealand when her family vehemently opposed its continuation. 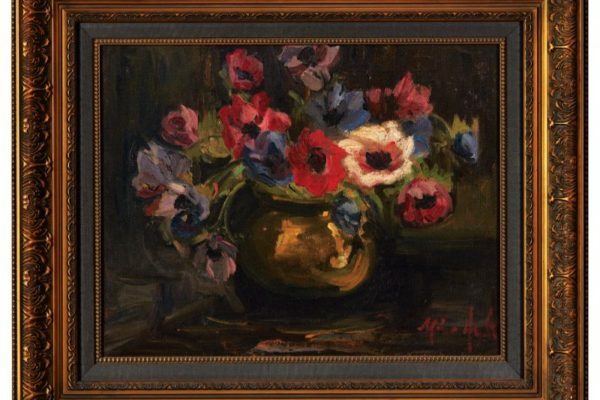 Arndt’s oil paintings are scarcely seen at auction but this sale includes a fine still life titled Anemones in Brass Bowl. With great personal determination, both Louise Henderson and Maud Sherwood continued to paint, leaving a legacy of magnificent artworks. Both artists were collected by Peter and Helene, and represented in their exhibitions, and fine examples are included in this auction. 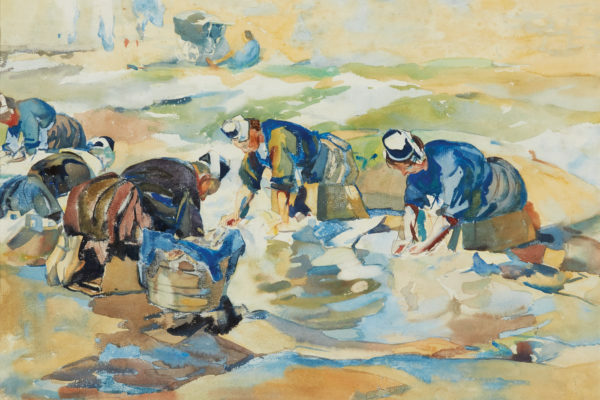 Maud Sherwood’s work is represented with Washer Women, Brittany, a superb watercolour demonstrating her finest work as a watercolour artist. The collection also includes work of institutional quality such as the rare Nor West Goes Over, the 1936 oil by Ngaio Marsh. A world-famous crime writer and nationally celebrated Shakespeare producer, she was also a skilled painter, whose works were exhibited alongside other notable Christchurch artists in the 1930s. In 1927, Marsh was one of the half-dozen women (Margaret Frankel and Evelyn Page were others) who started The Group, a boutique progressive alternative to the Canterbury Society of Arts which eventually had most of the best painters in the country as members. Nor West Goes Over is one of the largest and most fully resolved oil landscapes ever to be offered at auction. Portrait of Trevor Moffitt, by Leo Bensemann, is one of the jewels of the collection and is arguably one of the artist’s most significant portraits. This work, hung in Moffitt’s home until shortly before his death, is illustrated on the wall behind Moffitt in the biography of the artist. 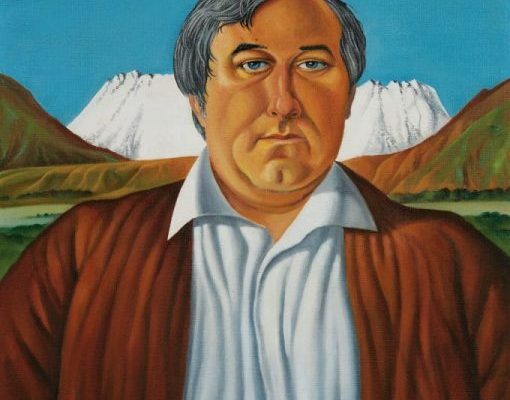 This painting has been illustrated in numerous publications since it was first exhibited at the 1977 Group Jubilee Exhibition at the Robert McDougall Art Gallery in Christchurch and its significance is discussed more fully by Peter Simpson within this catalogue. In the Void, by Pat Hanly, was featured alongside other works by the artist in the Ferner Galleries’ Retrospective Exhibition in Parnell in 2003 and retained by Peter and Helene for their personal collection. Pat visited the exhibition several times, providing an opportunity to photograph him reunited with this work from his 1967–71 Molecular Aspects series. Originating from the United Modern Masters Collection, Untitled (Red and Blue), by Don Peebles, has, until now, hung prominently in Peter and Helene’s home in Taupo. 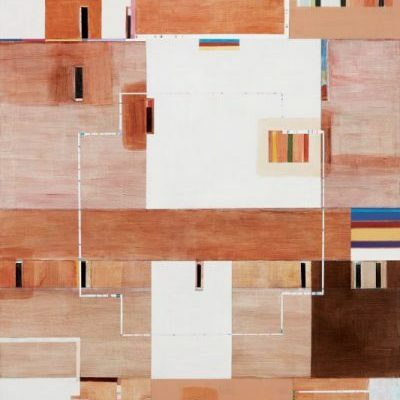 Representative of the large-scale corporate collections which were formed in the 1980s, this work is the most significant by the artist to be offered at auction in recent years. Traversing the historical, early modernist, modernist and contemporary periods, as well as all forms of media from large works in oil to watercolours, prints and photography, Peter and Helene’s collection provides a wonderful insight into their personal journeys as collectors as well as their professional careers promoting New Zealand art through their group of galleries across the country. Certainly, however, Peter and Helene intend to continue collecting, with their future collection focused on developing a sculpture park within the grounds of their Taupo home.